In the context this translation seems to make sense. However, when take a look at the original Hebrew it doesn’t exactly say this. The original text says, ushmartem et hamatzot. This literally means “And you shall guard the matzah.” From this we learn that matzah used for Passover (particularly the first night) needs to be made at a higher standard than matzah that is eaten year-round. This matzah is called shmurah matzah, or guarded matzah. Normal matzah that is “kosher for Passover” has protective measures that ensure no moisture comes in contact with it from the time the grain is milled until it is baked. Shmurah matzah, however, has additional measures that ensure the grain is free from moisture beginning from the time it is harvested. It is this extra measure of guarding that makes the difference between shmurah matzah and regular matzah. There’s a lesson to be learned here. If these extra precautions make the difference between regular matzah and shmurah matzah, then there must be something we can learn from the differences between the making of matzah and regular bread as well. When we look at a piece of matzah and compare it with a piece of leavened bread (particularly sour dough, which was the only type of leavened bread known to the ancient world), what do we see? What is the difference between the two? One is flat, having been quickly baked before giving it time to rise; and one is puffed up, having been allowed to rise before baking. They have both been made from the same basic ingredients: flour and water. The difference between the two is that someone had to pay close attention to the unleavened bread to ensure that it did not rise, while the other was left alone to do what it does naturally. Before we go further, we need to look at one more thing. If we look closely, there’s actually a play on words that is found in this same passage that instructs us to guard the matzah. Since the Torah was written without vowels, this same phrase, ushmartem et hamatzot, can also be read ushmartem et hamitzvot. The first means to guard the matzah as we have already discussed. But the second means to guard the mitzvot, the commandments. 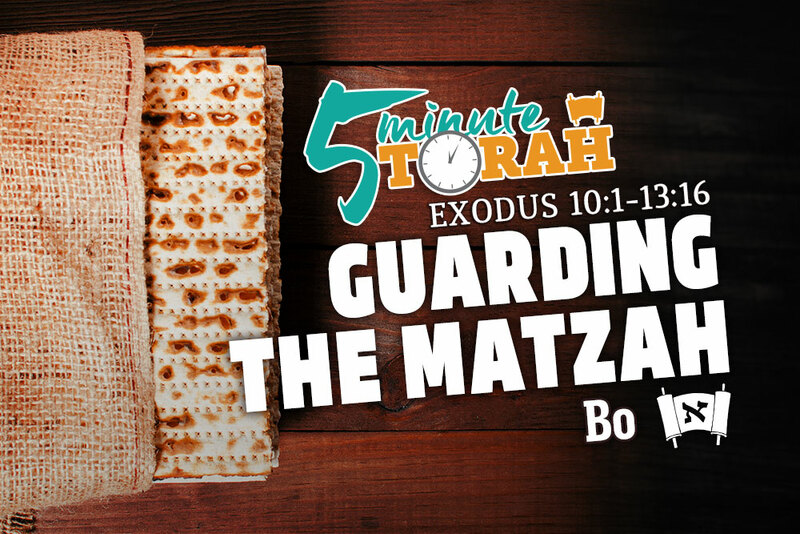 In this reading we learn an even deeper lesson: when we guard the matzah we are guarding the commandments. How so? The Talmud asks the question, “Who prevents us from performing Your (i.e. God’s) will?” It answers its own question by responding, “The leaven in the dough” (b.Berachot 17a). As we know, leaven is the quintessential representation of sin. It represents that which is impure, corrupt, infected, and arrogant. Unfortunately, humans don’t automatically do what is right. We make excuses for why we don’t need to go out of our way to do something we know we should. But in the case of observing the details of the Passover Lamb it was critical to obey every detail of Hashem’s instructions in order that the firstborn of the Children of Israel would be spared. But what would have happened if they decided skip some of the details the LORD had instructed them to carry out? It wouldn’t have gone well. As seen in the analogy of the bread, it’s easy to allow the leaven of sin to creep in. Just don’t do much of anything. Don’t put your guard up. Don’t do regular self-examinations. Don’t spend regular time in prayer and study each day. Don’t do anything that would enhance you spiritually. And especially don’t go out of your way to observe a commandment with any kind of detail. Just go about life getting by with the least amount of effort possible. Sin will work its way into us without us having to do a thing. Remaining pure and unblemished by sin and the world, however, requires much more effort. It requires us to be proactively aware of our spiritual condition and to guard against the influences of the world, rather than sitting back and allowing the world and its influences to slowly permeate us. It’s the difference between a loaf of bread and a piece of matzah. And to the degree we put up our guard, it is the difference between regular matzah and shmurah matzah. When we guard the matzah we are guarding the commandments. And when we guard the commandments we are guarding the matzah.